My name is Thidarat I am a full time Thai government employee working in Bangkok. I love to design and craft the jewelry by myself. I am happy when I see others appreciate my designs. This inspires me to make more beautiful jewelry. My designs are made by friends and family in Lamphun, the northern province of Thailand. My satisfaction comes from being able to create work and income for the people back home so that they can have a better life. I like the design of this necklace. It can be worn with jeans, and some. I would consider it as having a rugged look for a pearl jewelry. I also lucked out that the FW pearls used in the particular necklace I received are all decent looking. 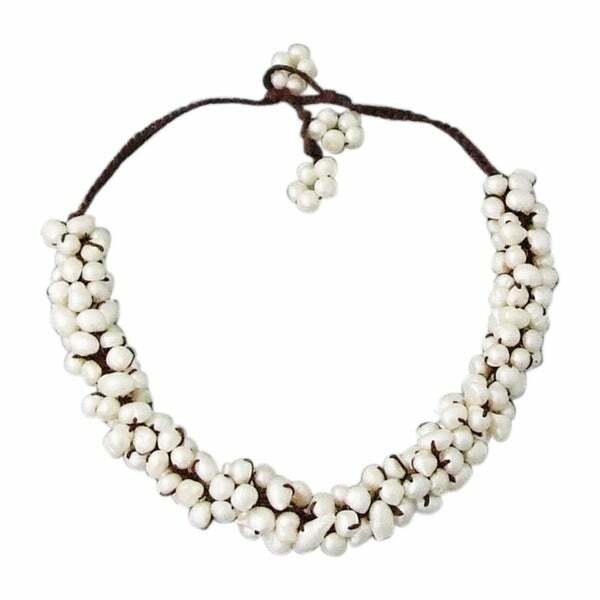 (I am mentioning this because the bracelet I bought to match this necklace had some really ratty-looking pearls on it. I think the quality control could have been better). The necklace looks good worn as a choker (worn close to the neck as much as possible), but the loop and pearl that attaches together when wearing the necklace, make for a necklace that hangs way below the neck. I will have to make adjustments. It is a good thing that I do not find the task impossible to do on my own.